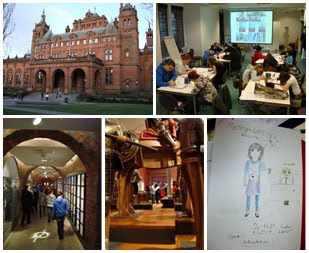 Last Sunday was spent at the museum, the Kelvingrove Museum and Art Gallery in Glasgow to be precise. 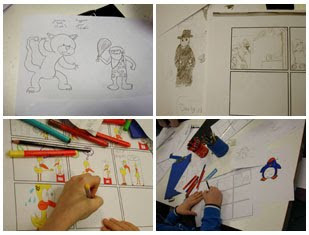 There we delivered a comic workshop to a group of young people (aged 12 to 17). The session lasted three hours and everyone had plenty of time to create characters and develop a story (to be set in a museum of course!). Quite a few finished comics were even produced on the day. Museum attendants Lyn and Jessica also took us all for a guided tour around a few of the excellent galleries, through some secret passages and past suits of armour. Everyone soaked up the atmosphere, gathered fuel their stories and thought a little about taxidermy. It seemed like everyone got inspired and made some notes and lots of sketches. Here are just a few photos and some samples of the great work that was produced. More can be seen on our Picasa photo album here.